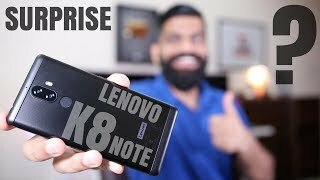 Want to experience a new level of performance – go for the Lenovo K8 Note with a first-of-its-kind 10-core processor plus up to 4GB of RAM and 64GB of storage. It comes equipped with 2 parallel rear cameras with 13MP and 5MP depth sensors to capture the DSLR-like depth of field effect. Experience a smoother and more responsive performance with 200% higher performance. Without a glitch, shift from one app to another. The inbuilt google assistant is always there to help you. Its stylish design with a premium metal body, flawless bilateral symmetry, corners with ergonomic curves, just makes Lenovo K8 super trendy. Bring out your creative best with K8 Note’s dual rear cameras. Take amazing selfies with high resolution 13MP front camera with party flash. Enjoy crystal clear images on the K8 Note’s 5.5-inch Full HD display featuring 2.5D glass. Its party flash feature can get you great looking selfies anywhere. With Dolby Atmos® from the K8 Note’s built-in speakers, enjoy sound with clarity, richness, power, and depth. Its Android 7.1.1 Nougat offers a smooth and responsive experience. Recognizing only you, K8 Note’s secure fingerprint sensor logs you in with a swipe of your finger in just 0.3 seconds.